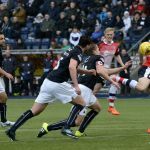 Raith Rovers slipped further down the Championship table this afternoon, after a 1-0 defeat to Falkirk saw them leapfrogged by Dumbarton and down to eighth. 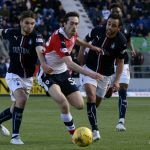 Manager, John Hughes made two changes from last weekend’s 1-1 draw with Queen of the South, both of which were enforced through injuries. 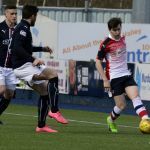 Jason Thomson failed a late fitness test, so he was replaced by Kevin McHattie, while Ross Matthews dropped out after picking up a knock, with Iain Davidson coming back into the midfield. 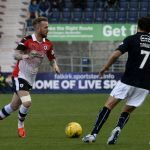 The return of McHattie to the left-back position, meant that Kyle Benedictus moved across to the opposite side at right-back, whilst Davidson slotted into the space vacated by Matthews in the middle of the park. 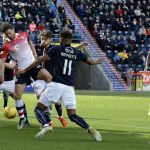 Rovers last away win in the league was at the Falkirk Stadium back in October, and their start to the match as suggested they were capable of repeating that feat, with the first couple of chances falling to them in the opening stages. 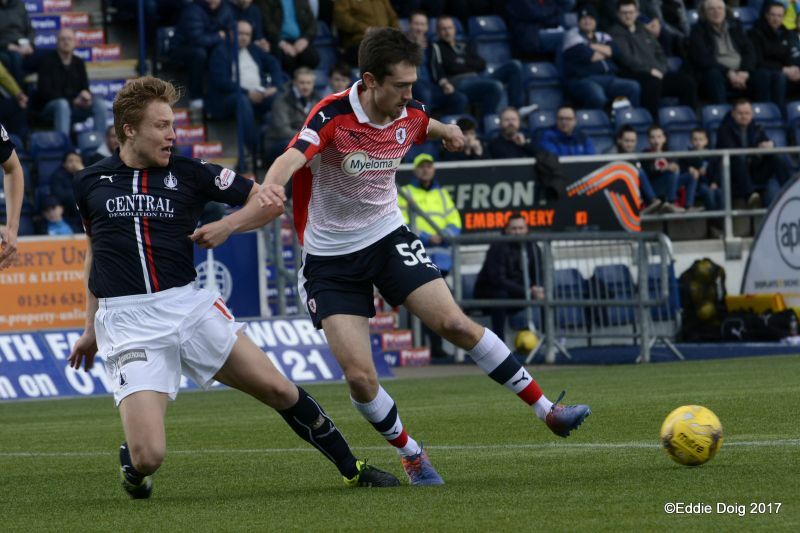 Ryan Hardie got the better of Peter Grant on the edge of Falkirk’s box, nudging him off the ball before teeing up Chris Johnston. 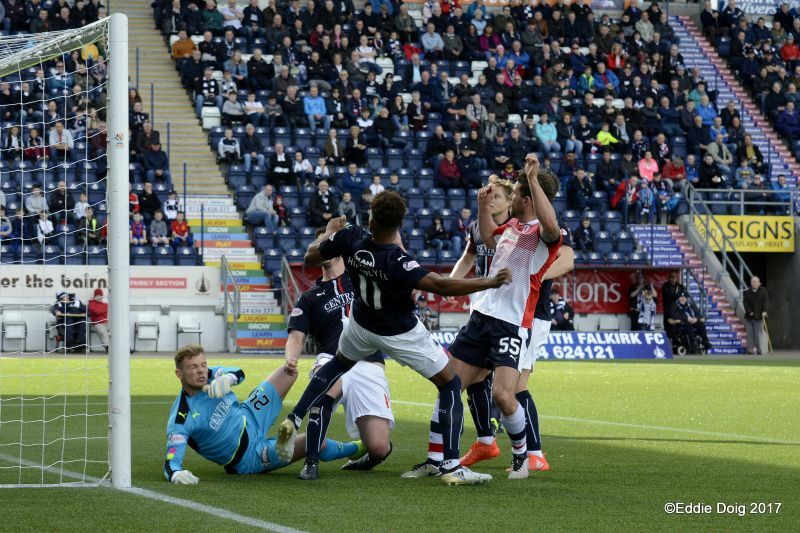 With Grant out of position, a huge gap had opened up in front of the midfielder, but his shot was tame and straight at Bairns ‘keeper, Robbie Thomson. 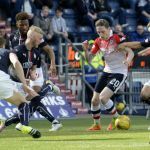 While that opportunity had been something of a half-chance, they squandered a far better one in the tenth minute. 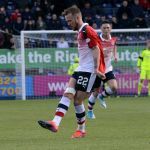 Davidson’s free-kick from the left found Craig Barr inside the six-yard area, but from a couple of yards out, he couldn’t quite get enough onto the in-swinging ball, stabbing it onto the bar from point-blank range. 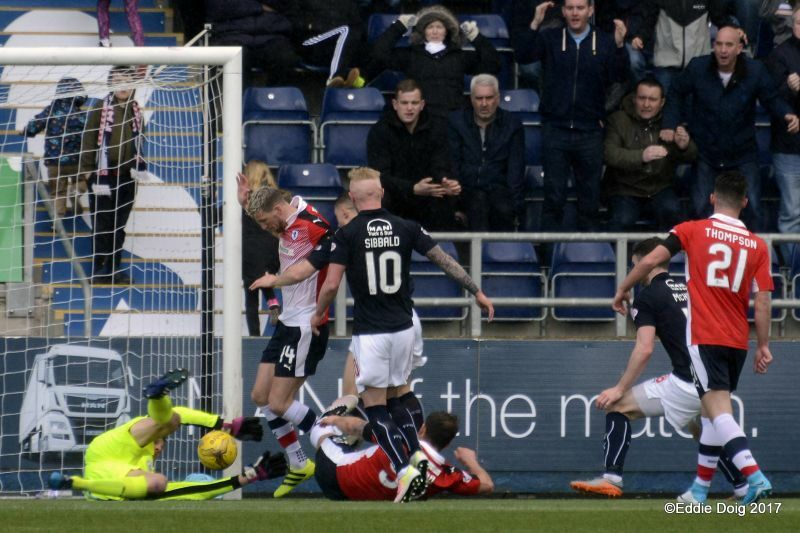 It was a fine start to the match for the away team, but they had an enormous let-off after 15 minutes. 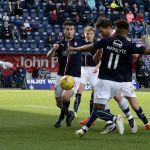 Myles Hippolyte’s long throw was allowed to drift towards the back-post, to Fraser Aird who’d made a late run into the box. 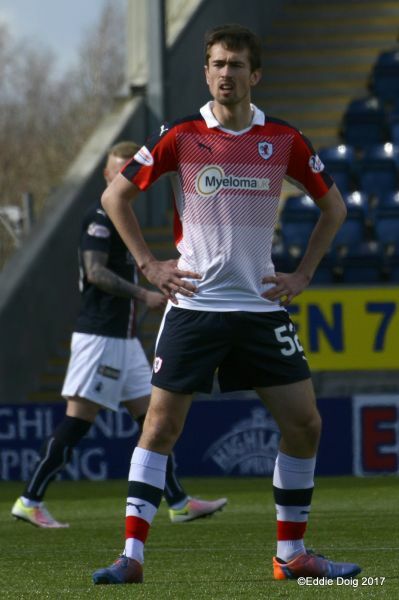 However, while the Canadian international recently scored a fine goal in a friendly against Scotland, his finishing let him down on this occasion, as he lashed his shot wide from 15-yards. Aird was involved again five minutes later, and this time his accuracy was greater, albeit with a cross ball rather than a shot. 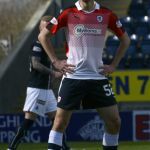 His searching effort from the right found John Baird inside the area, but although he got enough on it to steer it towards goal, Pavol Penksa was alert enough to safely gather the former Raith man’s effort. 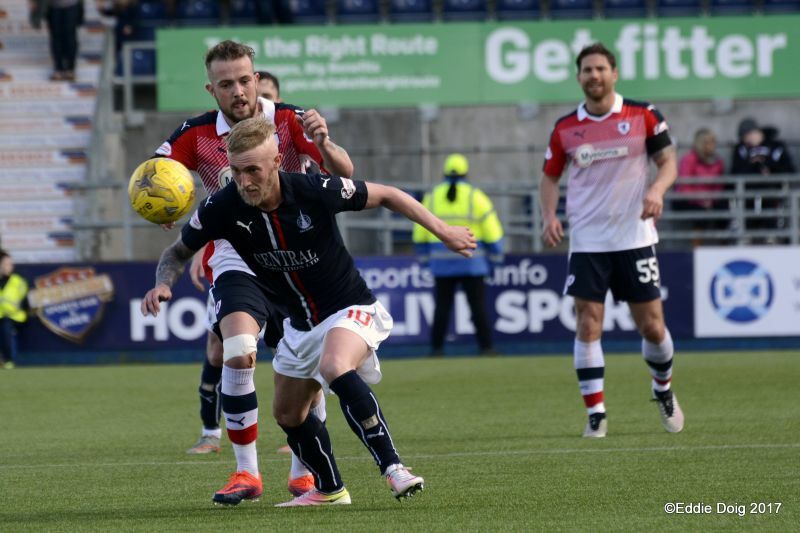 It appeared the game was starting to swing Falkirk’s way at this point, with Craig Sibbald controlling things in the middle of the park, while Aird and Hippolyte were making life difficult for the Rovers full-backs out wide. 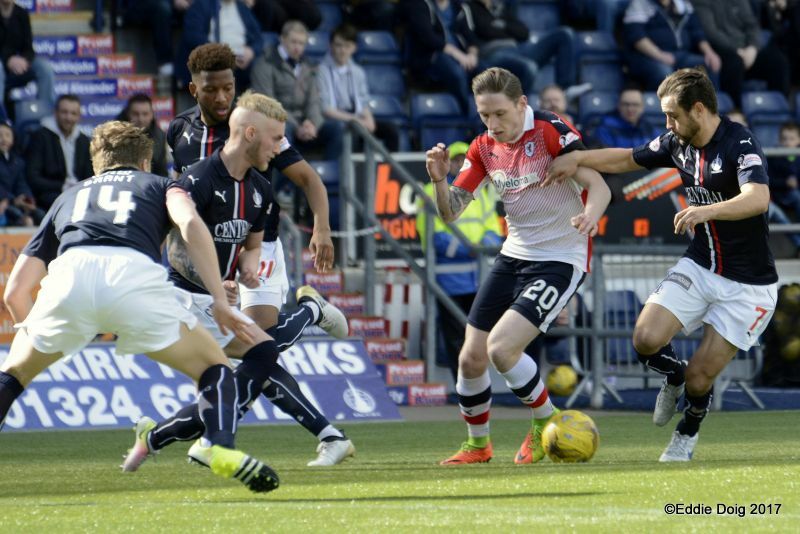 Aird was again the architect of Falkirk’s final chance of the half, when his cross was met by Luca Gasparotto, although the defender was unable to get his header on target, meaning the sides went in at the interval all-square. 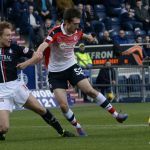 Rovers were forced into a change at half-time, with Ross Callachan, who had been heavily bandaged in the first half after picking up a knock, replaced by Danny Handling who made his debut. 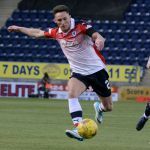 The hope was that the introduction of the attacking midfielder would help give the Falkirk defence something to think about, but it was the home side who were straight on the offensive once the half started, with Aird again in the thick of things. 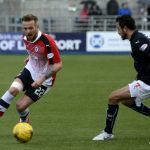 McHattie was unable to stop his advances, and although he was able to pick out Baird in the area, the forward was blocked out by a posse of defenders. 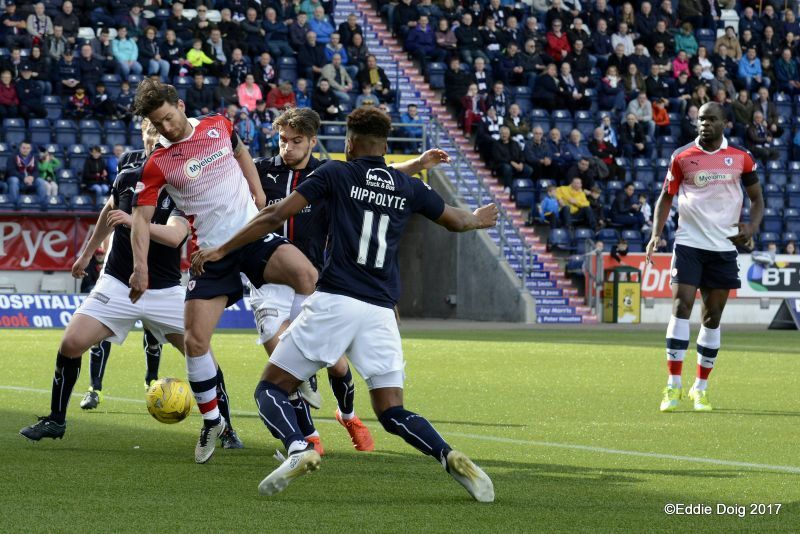 Shots at goal from Raith were few and far between, although Hardie did have a sight when played through by Jordan Thompson, but his fizzed attempt from outside the area was deflected away by the leg of Gasparotto. 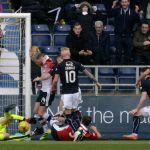 If there was to be a goal though, Falkirk looked the likelier scorer of it, and they were inches away from getting it after 60 minutes. 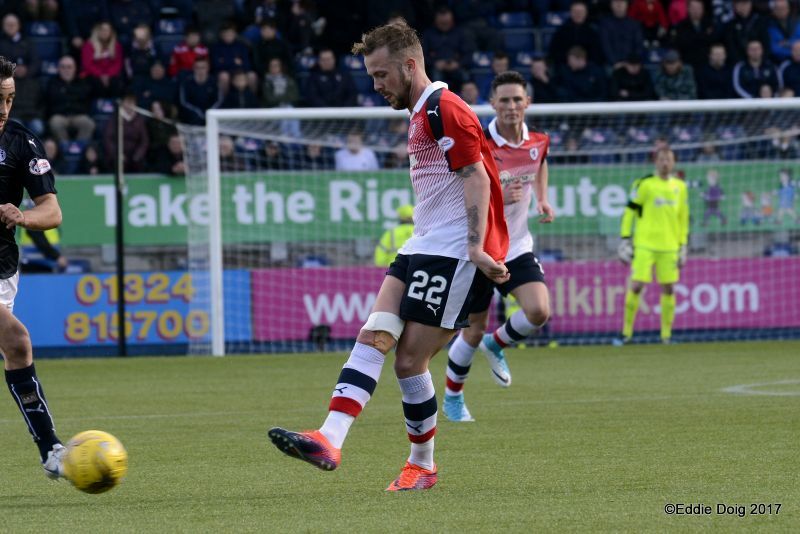 Lewis Kidd slotted the ball between McHattie’s legs and gathered it at the other side, before whipping a low cross towards a clutch of players at the front-post. 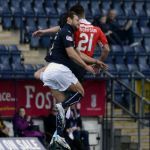 It initially appeared that Penksa had lost the opportunity to grab it, but after a stramash involving numerous players, the Slovakian was able to hold onto the ball despite the best efforts of John Baird. 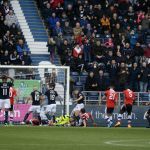 Rovers had rarely been seen in an attacking sense in the second period, but they really should have taken the lead a minute later. 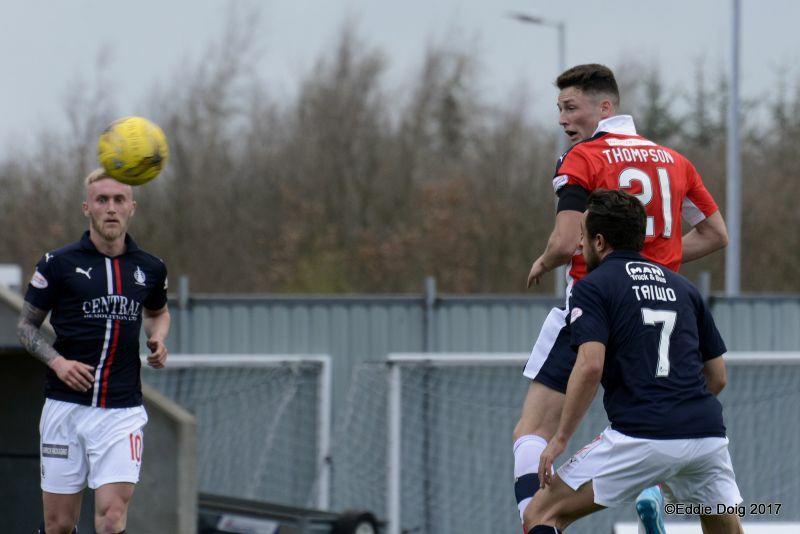 Declan McManus did well wide on the left, cutting inside before letting fly, but although his shot was blocked, the rebound fell to Johnston, who didn’t quite get enough on his effort, allowing Thomson to block his effort from eight yards. 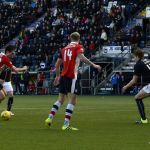 When a team is in bother near the foot of the table, they have to take full advantage of any chances that come their way, but after spurning their best of the match, they found themselves a goal down with 20 minutes remaining. 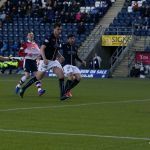 Lee Miller had just been introduced by Falkirk manager, Peter Houston for John Baird, and the switch reaped immediate dividends, with the experienced forward netting the winner. Lewis Kidd’s delivery from the right found Miller unmarked in the area, and his first time effort flew past Penksa and into the corner of the net. 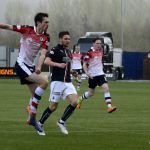 With time ebbing away, John Hughes made a second change, replacing Benedictus with Scott Roberts, but it was to no avail, with Falkirk comfortably seeing out the match for a deserved three points. 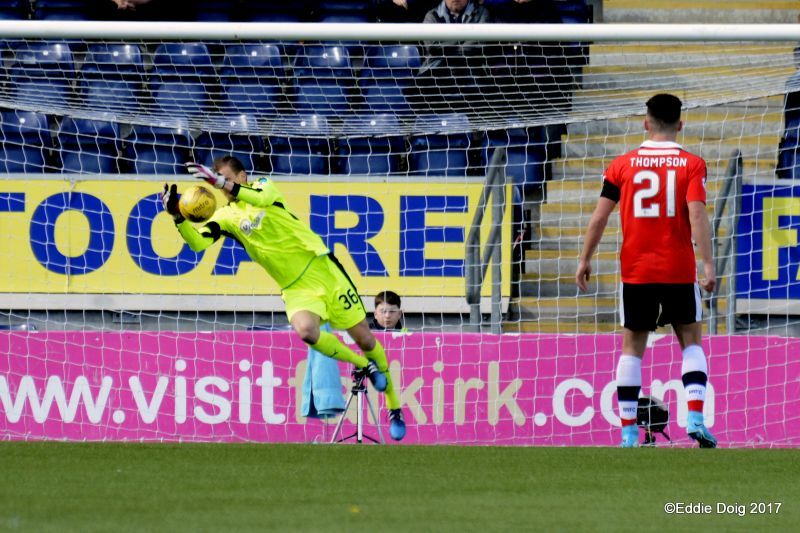 With Rovers now just two points ahead of Ayr and three in front of St. Mirren, next weekend’s Fife derby against Dunfermline, will take even greater importance than usual. Welcome to the Falkirk Stadium, it's 13 degrees, sunny and slightly breezy. The teams have warmed up and are in the dressing rooms getting final instructions. 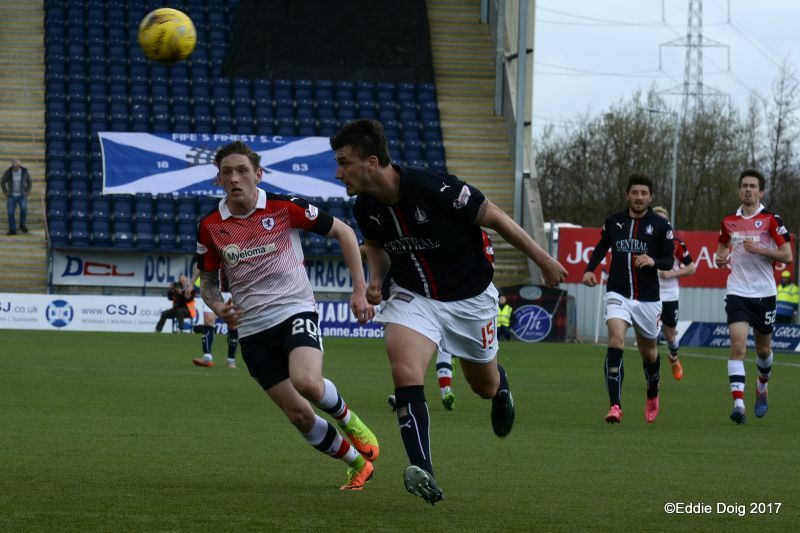 Falkirk kick off towards the Raith support. Benedictus stealing the ball but his pass to Hardie is intercepted. 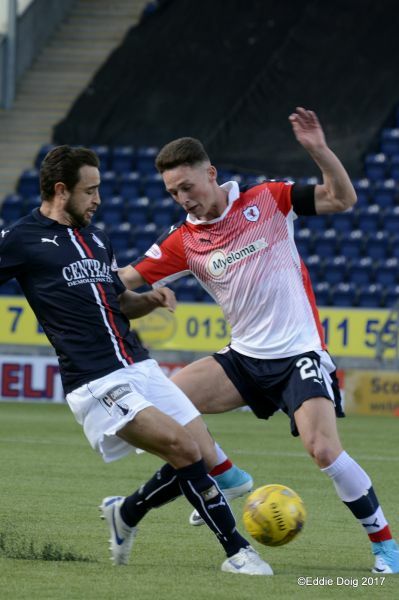 Austin with the cross to Aird, M'Voto cuts out the half hearted shot. 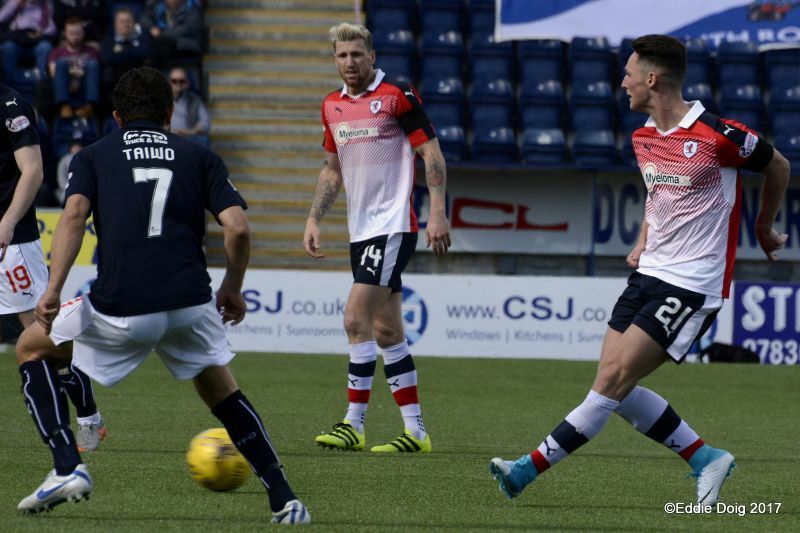 Hardie and Johnston combined the latter shoots just inside the box and Thomson gathered. 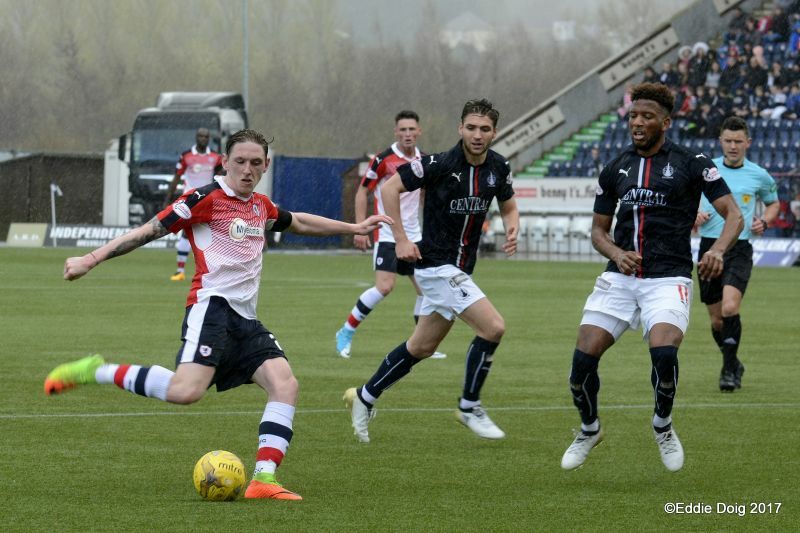 Sibbald shoots from the corner of the box, Penksa gathered low at the near post. 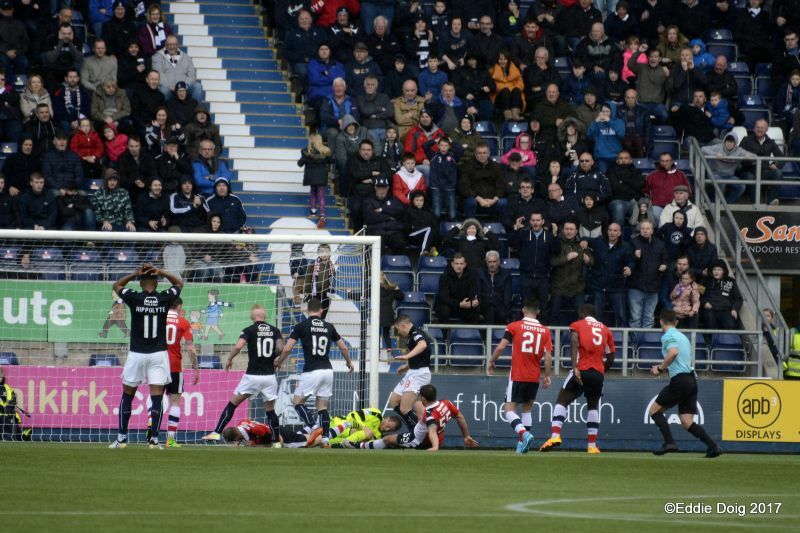 Mango forces a point blank save from Thomson as the ball came in from a free kick. Thompson shoots from 20 yards but it's blocked on the 18 yard line. 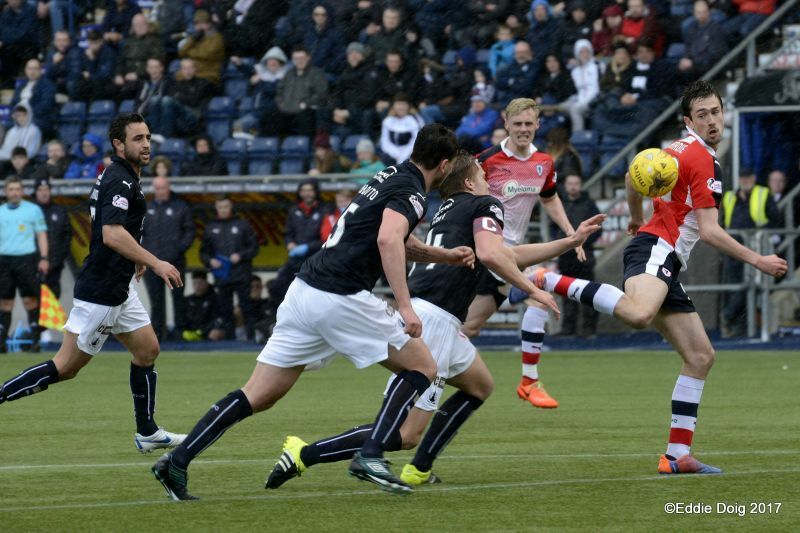 McManus dances past two defenders but comes unstuck as he goes to ground just inside the box. 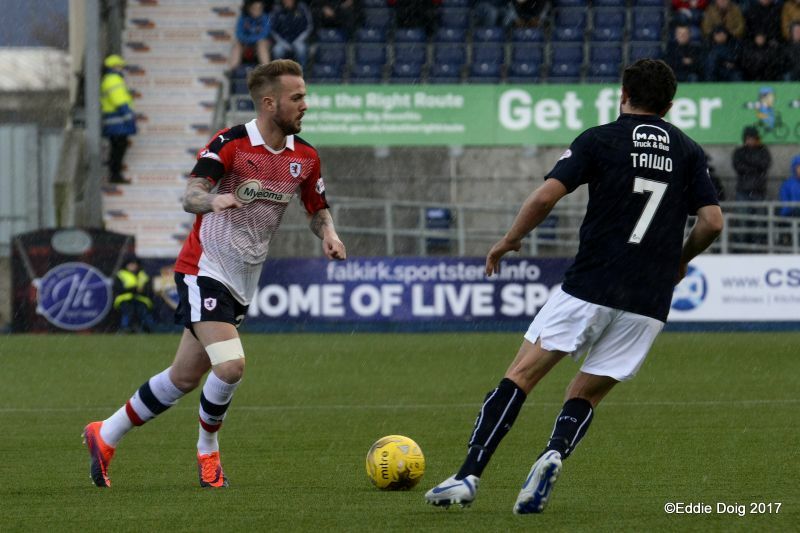 Aird in space missed a sitter from 12 yards. McHugh hits a tame shot from the left hand side, Penksa trots out to gather. 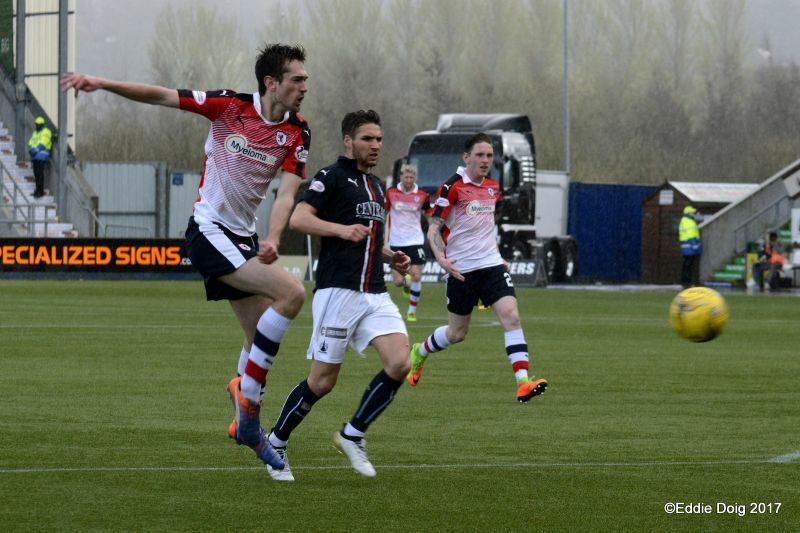 McHattie flights a ball into Hardie but his header is way over the bar. Baird shoots on the six yard line but is foiled by Penksa with an acrobatic save. 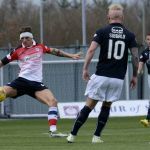 Callachan takes a knock to the face and is treated pitch side. 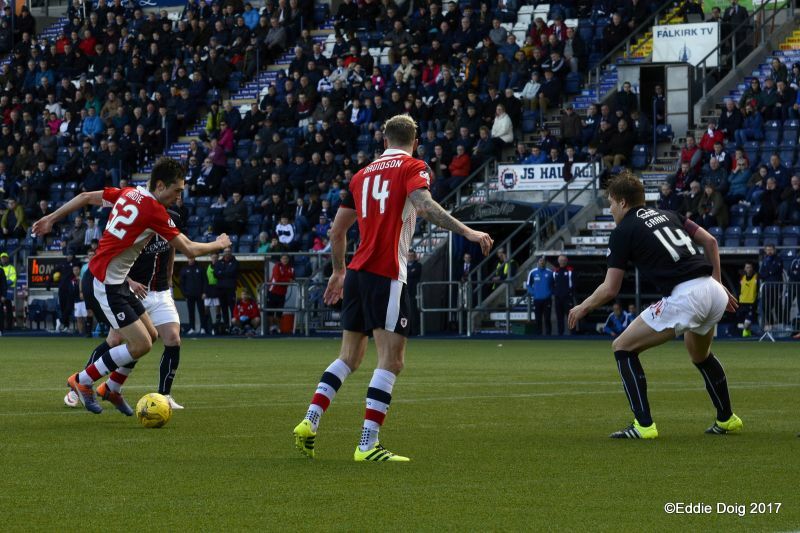 Sibbald plays keepie uppy in the box, the ball finally going to Baird his 'goal' ruled offside. 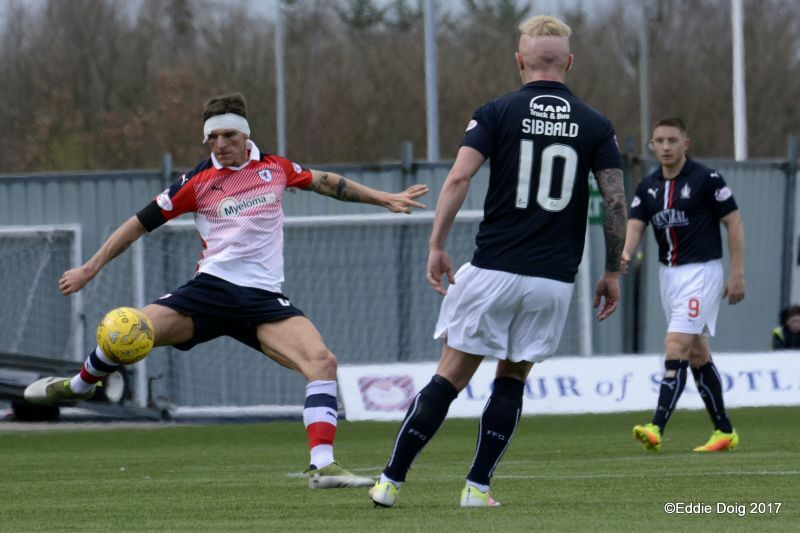 Callachan back on the pitch looking like Rab C Nesbitt. 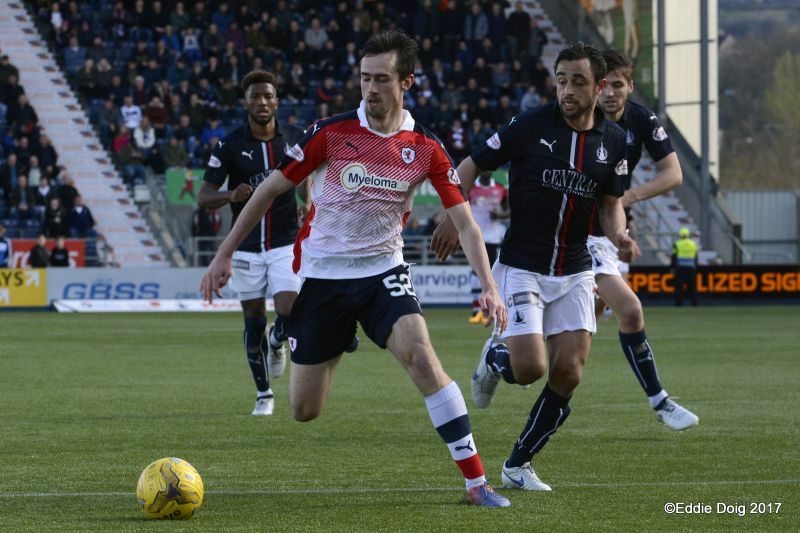 Callachan injured in a clash with Hippolyte. 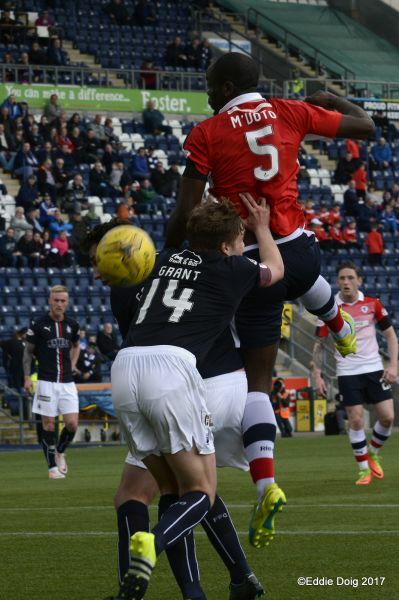 McHattie yellow for a foul on Taiwo. 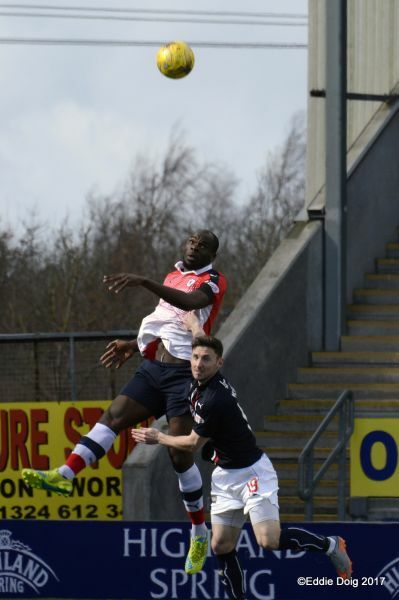 Hippolyte crosses and Gasparatto heads narrowly over the bar. 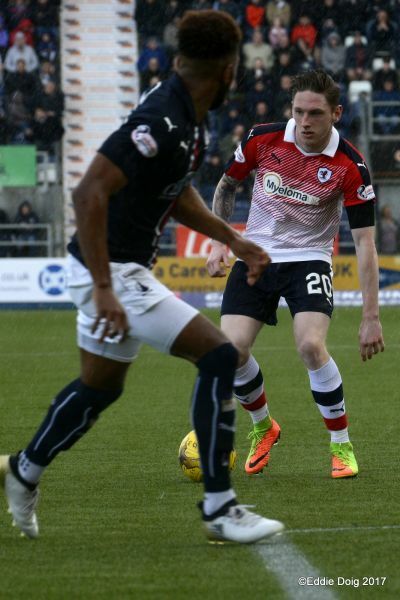 Aird from distance watched as Penksa tracked the ball and gathered. Penksa looking assured as he clutches another long range shot. 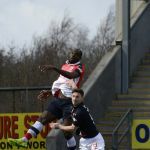 Hippolyte yellow for kicking the ball away. 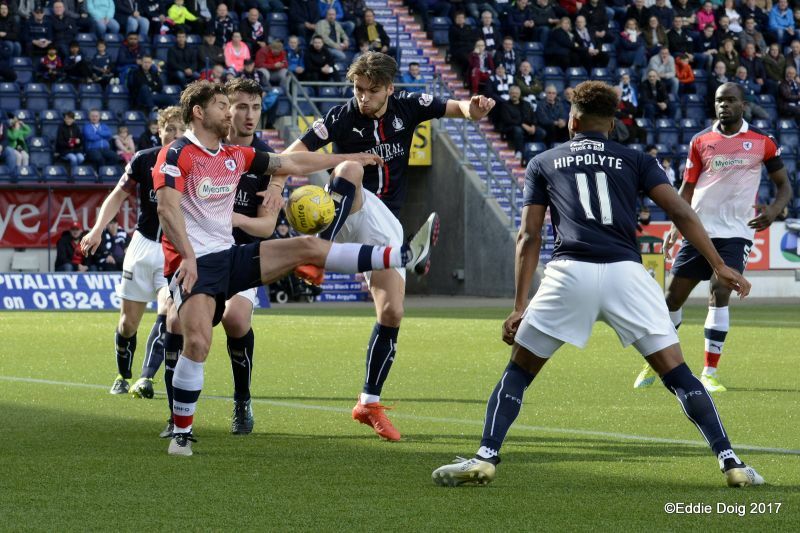 +1 Half time, Falkirk 0-0 Raith Rovers, the home side edging the game in the first half. Callachan off, Handling on. The heavens open and it is chucking it down. 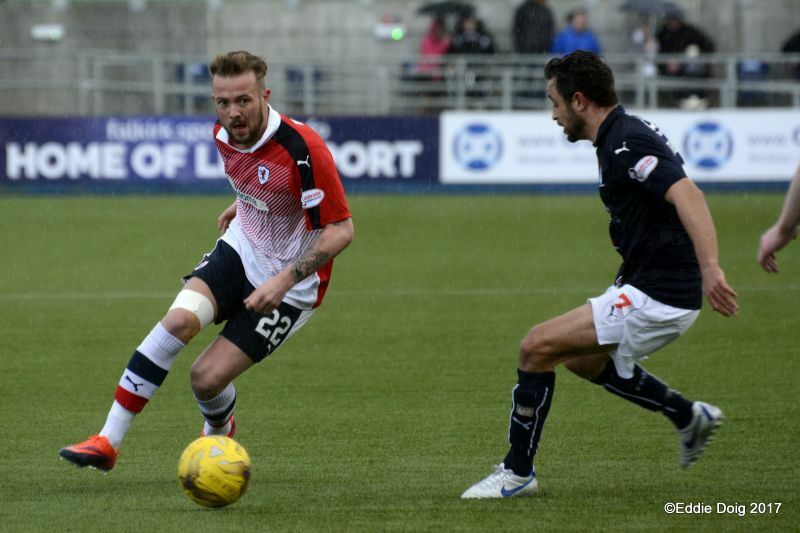 Big Jock cuts out a Baird run on goal. 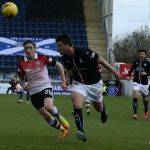 Davidson heads behind to deny Baird. Baird and Davidson receive a lecture. Penksa gathers a corner on the goal line, howls for a goal from the home support. 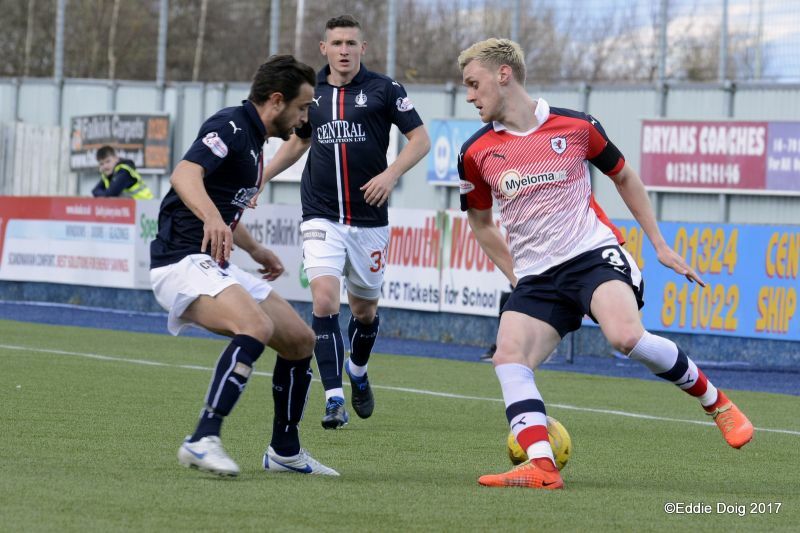 McHattie goes down in a heap but recovered to play on. 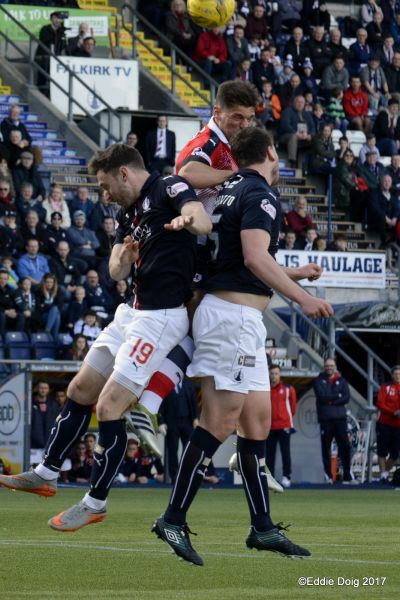 Kidd into the box, Baird on the line but Penksa smothered the ball, a let off. Grant yellow for a foul on Johnston. Point blank block by Grant from Johnston in the six yard area. 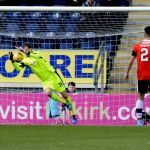 McHugh hits the bar as he turned 180 on the penalty spot. Baird and Aird off, Miller and Craigen on. 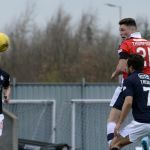 M'Voto heads on to Davidson who has the ball knicked ftom his head by Thomson. 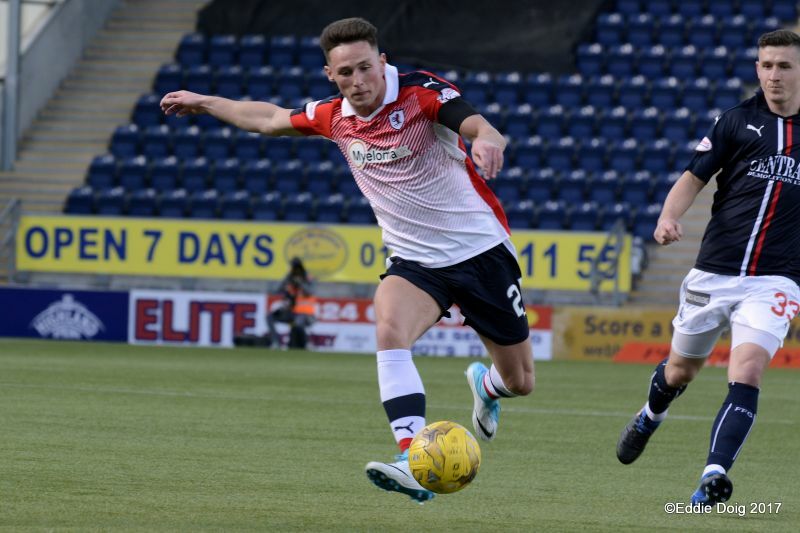 Goal Falkirk, Lee Miller from 6 yards. Craigen with the assist for the Miller volley. 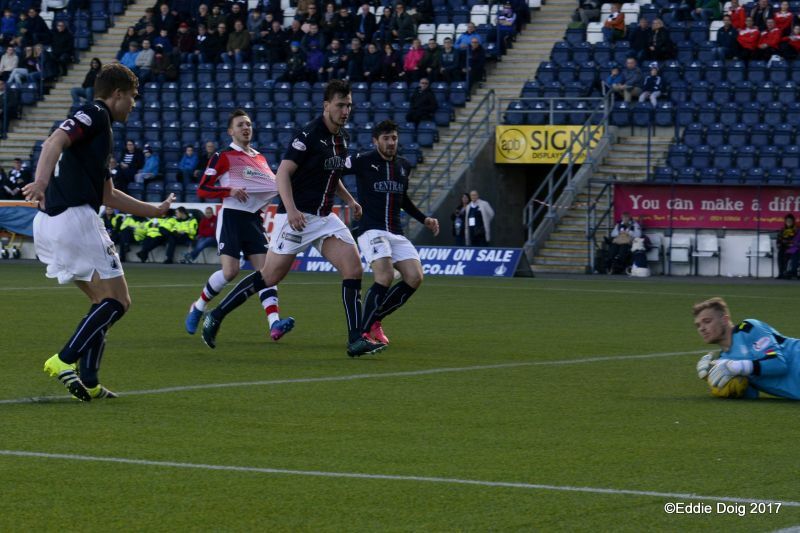 Hippolyte heads onto the bar but is ruled offside. Benedictus injured and receives treatment on the pitch. Roberts stripped and waiting to come on. A James Craigen shot us blocked by M'Voto in the area. 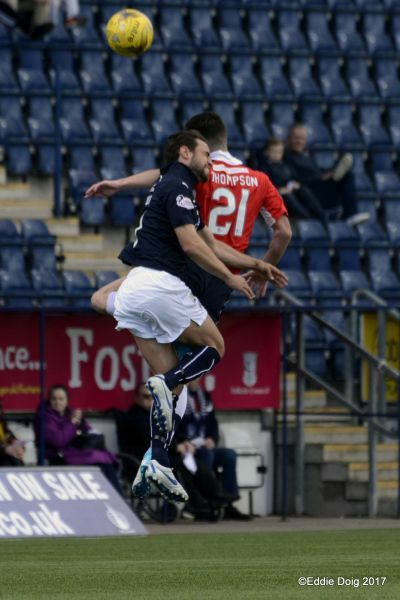 McHugh wins a corner from a cross from Craigen. Craigen lobs a ball into the box, Penksa gathers. 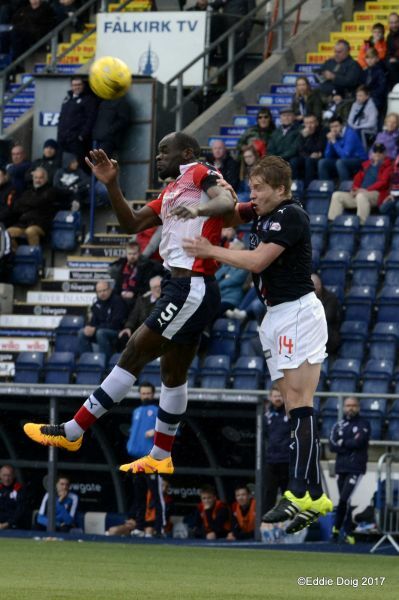 Thomson smothers a cross from Hardie. +2 Full time. 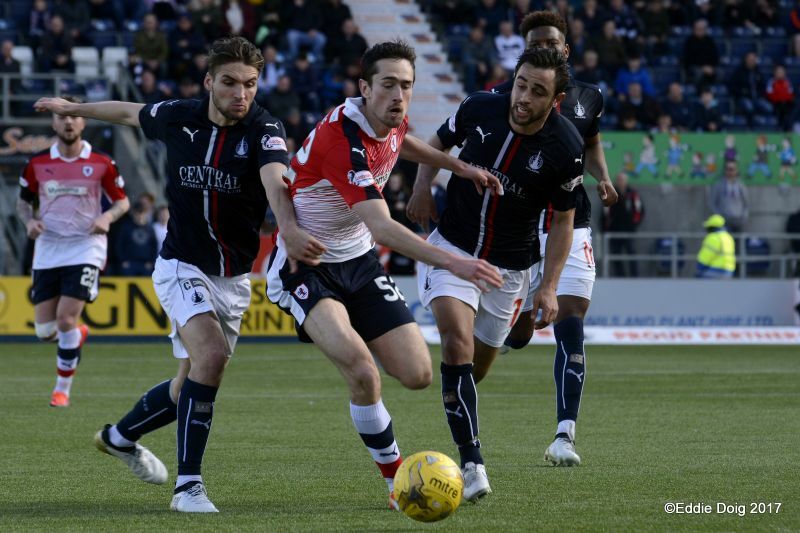 Falkirk 1-0 Raith Rovers. 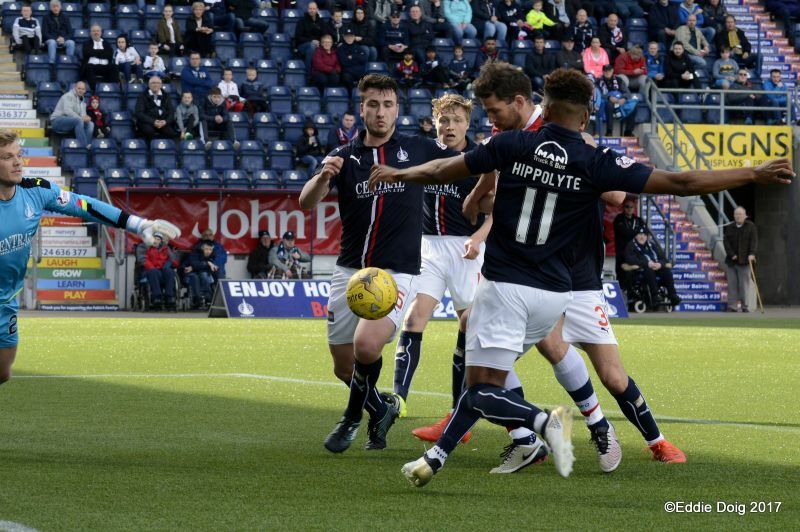 Thomson, Kidd, Leahy, Taiwo, Baird, Sibbald, Hippolyte, Grant, Gasparatto, McHugh, Aird. Subs, McMinn, Muirhead, Kerr, Austin, Miller, Shepherd, Craigen. 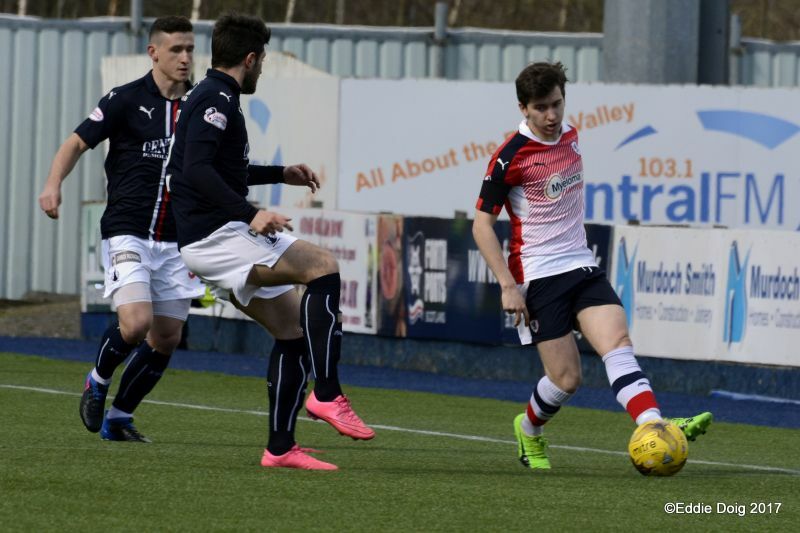 Penksa, McHattie, Callachan, M'Voto, Benedictus, Johnston, Davidson, McManus, Thompson, Hardie, C Barr. Subs, Brennan, B Barr, Roberts, Skacel, Handling, Court. 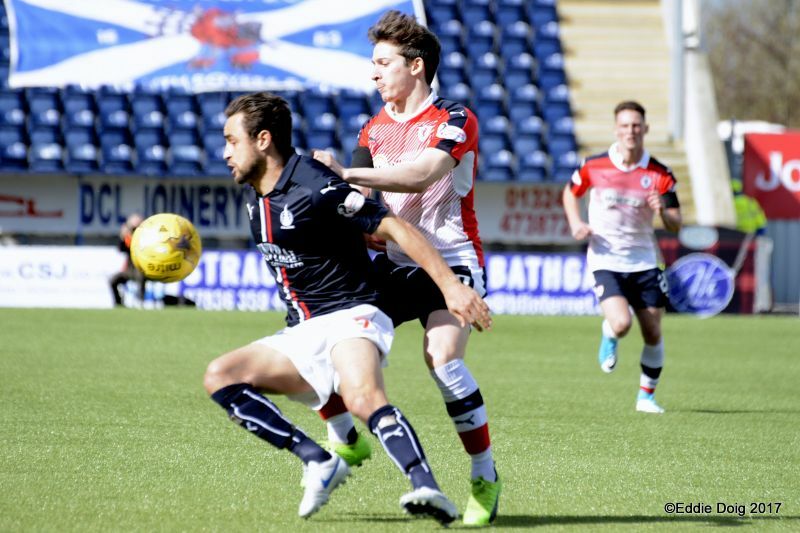 Raith head to the Falkirk Stadium this weekend, for another huge match, that could go a long way to securing their Championship future. 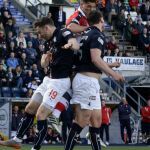 They face a tough task against a side which has it’s eyes firmly set on taking second place in the table, and with it, the avoidance of a play-off round, but Rovers have already produced one of their finest performances of the season at the same venue back in October. 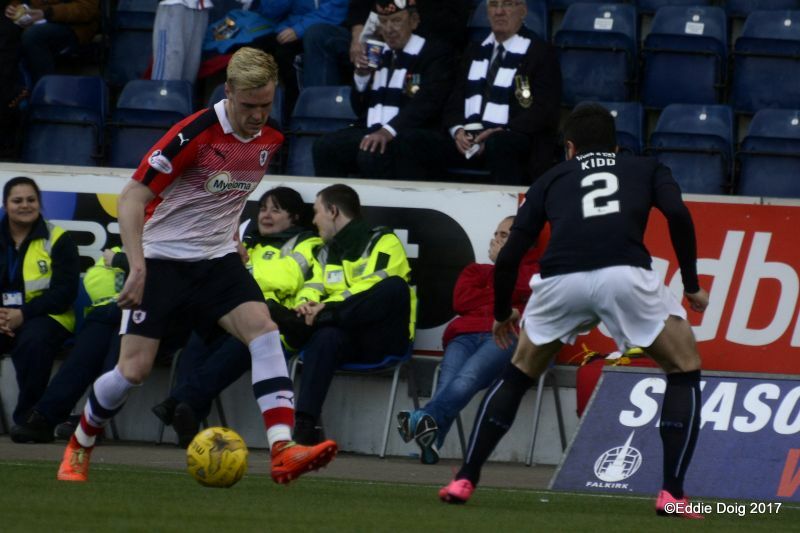 Iain Davidson put Raith ahead in the 17th minute, only for John Baird to equalise seconds later. 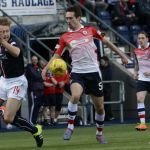 Mark Stewart and Declan McManus appeared to put the game beyond doubt in the second period, although Lee Miller then reduced the arrears with 15 minutes remaining. 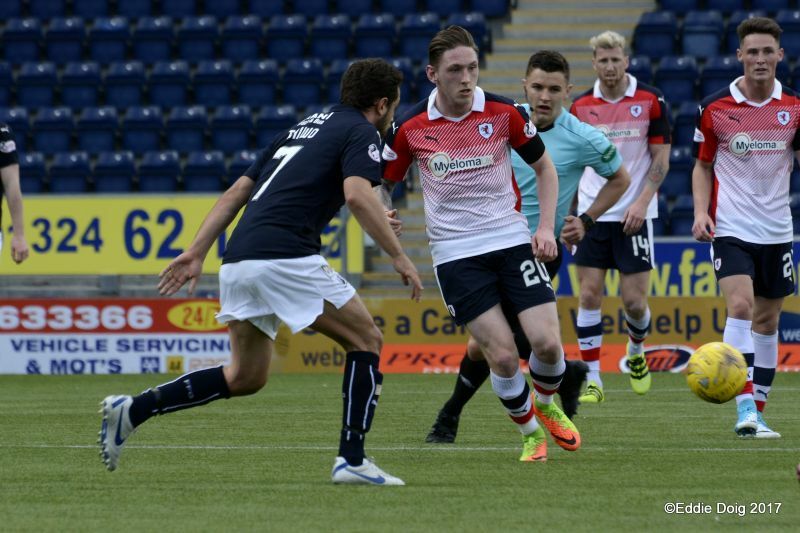 However, Stewart completed his brace and secured the points in the 79th minute, to seal an impressive 4-2 win. 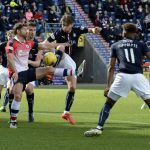 It’s been a different story in the two matches at Stark’s Park this term though, with Falkirk taking maximum points on both occasions. 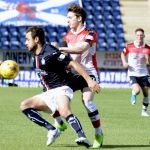 John Baird and Tom Taiwo were on the score-sheet in a 2-0 win for the Bairns in September, and it was an even more one-sided affair in January, when Falkirk produced an excellent performance to win 4-1. Chris Johnston put Rovers in front in the opening ten minutes, only for Myles Hippolyte to restore parity shortly after. 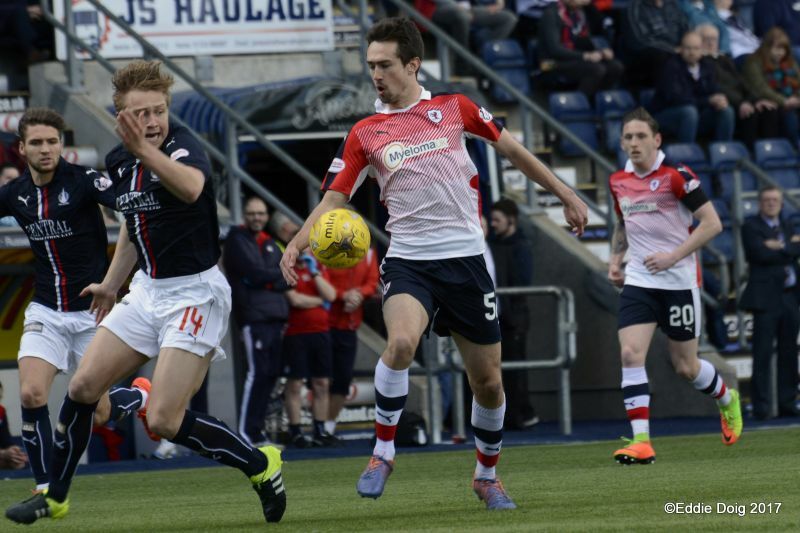 Goals from Bob McHugh and Craig Sibbald saw Peter Houston’s men 3-1 up at the interval, and a goal just after the break from Sibbald again, completed the scoring. 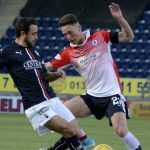 While Rovers have picked up four points from their last two games, Falkirk go into this fixture on the back of two straight defeats, after losing to Morton in the live Alba game two weeks ago, whilst last weekend saw them going down to a late James Keatings strike in a 2-1 loss to Hibernian. 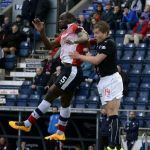 Rovers have a poor record in this fixture in recent times, with just two wins and three draws from the last ten meetings, although both those wins have come away from home.